Lock in a great price for Le Castel des Anges – rated 9.6 by recent guests! Perfect stay. Too bad we had to leave after 1 night. Breakfast and hosts are amazing! I will recommend it to my friends! 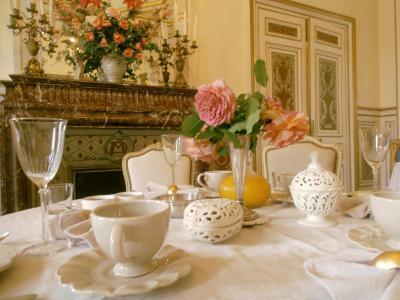 A beautifully restored chateau, gracious hosts, delicious breakfasts. It couldn’t be better. Superb experience. Very close to A16. We stayed one night but might have stayed longer. Beautiful, grand, house with superb interior. Probably the best continental breakfast I have ever had. Comfortable room with garden view. Lovely gardens to relax in. Lots of birdsong. Charming hostess but all staff welcoming. Very reasonable price for b and b. The village has an attractive restaurant and other amenities. It is close to the sea and historic sites. 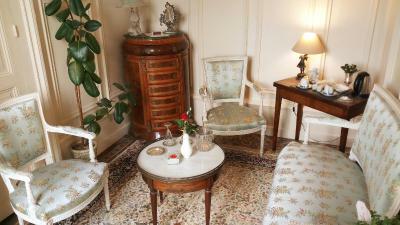 Delightful hosts, delicious breakfasts, really pretty hotel, spotlessly clean and wonderful recommendation for nearby restaurant au bon acceuil. Didn't want to leave. Everything superb. The breakfast especially was amazing. This property is stunning. The superb breakfast in the even more superb breakfast room. Such a privilege for us to stay here. And Sandrine and Dominique are wonderful hosts! If I could give more than 10 for every category I would. This castel is magnificent. Our suite surpassed our expectations in terms of space and comfort and beauty. The breakfast was delicious with homemade breads and jams. 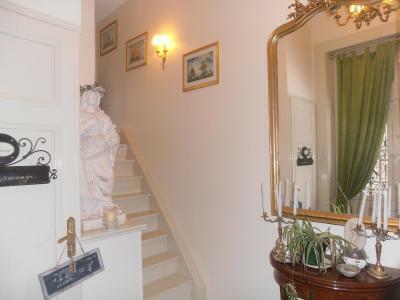 The owner is a very delightful lady who loves her home and naturally makes her guests feel at home. Beautiful place to stay. Lovely hosts. Fantastic room, was able to use facilities in the kitchen. The breakfast was amazing. Will visit again! Pretty much perfect. 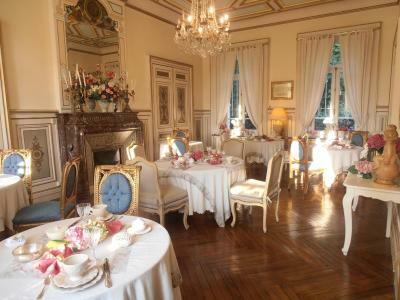 This château dates from the 18th century and offers a romantic décor and a large park with several terraces. At Le Castel des Anges, guests are free to relax or read a book by the fireplace in the elegant lounges. 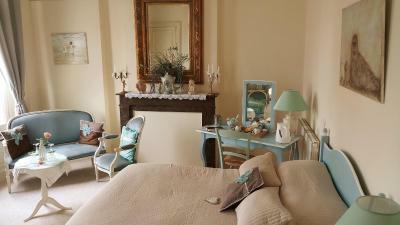 Le Castel des Anges proposes uniquely decorated guest rooms and one self-catering cottage. The rooms all have an suite bathroom, some with a spa bath, and the cottage features exposed wooden beams and a private terrace. Breakfast is served every morning and includes homemade bread, yogurts and jam, and there is an organic vegetable patch in the garden. Free Wi-Fi internet access is provided throughout the property and a restaurant can be found a 5-minute walk away. Free private and secured parking is available on site and the château is just 3.1 mi from exit 25 of the A16 motorway. Berck-sur-Mer and the English Channel are a 10-minute drive away and Le Touquet is reached by car in 20 minutes. This property also has one of the top-rated locations in Wailly-Beaucamp! Guests are happier about it compared to other properties in the area. This property is also rated for the best value in Wailly-Beaucamp! Guests are getting more for their money when compared to other properties in this city. 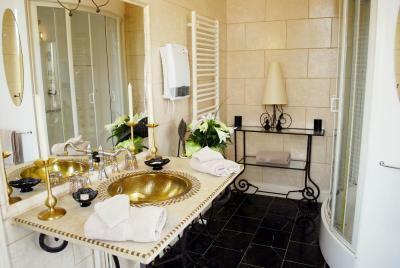 When would you like to stay at Le Castel des Anges? 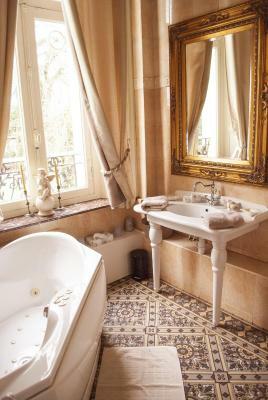 This room features a romantic décor and includes an armchair, a wardrobe and a private bathroom. This suite is composed of a bedroom and a separate seating area. It features a romantic décor and a wardrobe. 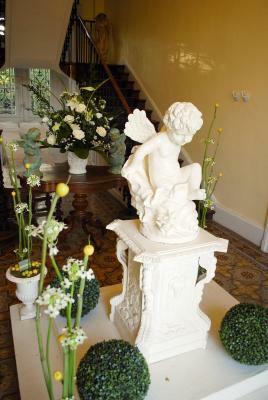 House Rules Le Castel des Anges takes special requests – add in the next step! Il était formidable, het was fantastisch, it was outstanding! 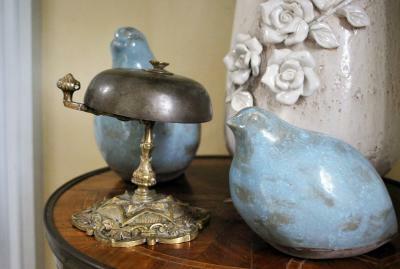 The French style and the beautiful little touches. The breakfast was superb. Still not so happy about the ensuite which is in the room itself and was slightly disappointed in the breakfast which was sausage and cheese but think that was arranged for the German guests, but a million times better than most places. Still lovely selection of breads and fruits in yoghurt... Very very hard to beat. Sandrine and her husband are so lovely and make you feel so welcome. 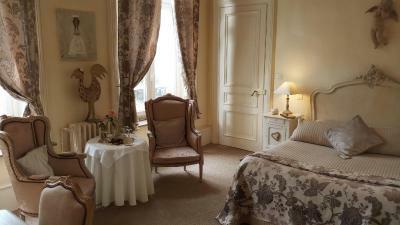 So pleased they were voted best value hotel in France for 2018 by Trivago. We love the house and had a tour of the garden this time. Breakfast was excellent. Choice of breads, croissants and cake. Fresh fruit cocktail, fresh juice and wonderful coffee. No restaurants open nearby when I stayed, but it was out of season and the council were carrying out roadworks at the time. Marvellous hosts, great breakfast. Interesting building as it was General Hague's HQ during WW1 battle of the Somme. 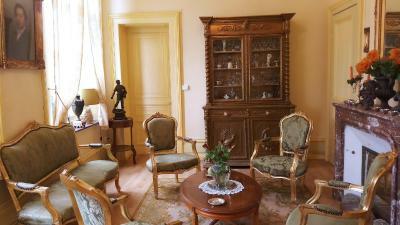 Beautifully renovated by the current owners, typical classic French chateau. Unfortunately there were no restaurants open within walking distance the day I stayed, even though I would still book it again. Breakfast superb. Conveniently located a short drive from the peage exit. Set back from a quiet road in the village centre. Short drive to the sea side. We had a friendly greeting on a very grey and wet evening. 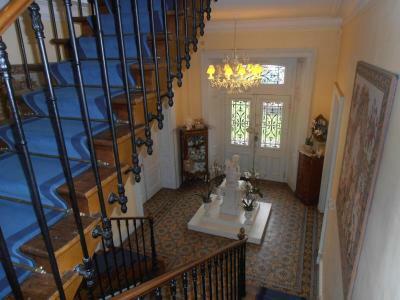 The whole property is decorated in a luxurious way reminiscent of days gone by. The breakfast was amazing. It was great value too. Breakfast was superb and Sandrine & Dominique were extremely friendly hosts. Road access was a bit unfortunate as they’re doing it up and there are ‘deviations’ all round, but persevere! Great hosts - really friendly and keen to help. Excellent breakfast. Loved the decor and attention to detail. Good value. Can really recommend. Wi-Fi connection did not work, however this allowed us to switch off from the world. Bliss. Great friendly and welcoming hosts. Excellent room and attention to detail, such as ensuring we had fresh water. Breakfast is superb and fit for a king or queen. Great location for exploring the local area. The breakfast is a beautiful occasion. Leisurely and indulgent. Absolutely charming stay. A beautifully restored chateau with a warm welcome. It was perfect - a pity we had to leave. 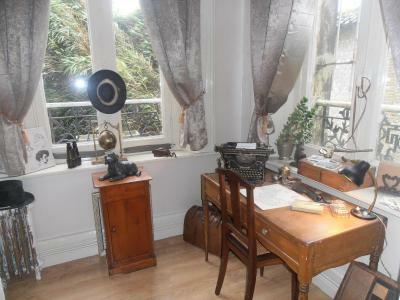 The location was perfect, near le Touquet and an excellent restaurant. We were looking for something special for my birthday and didn't want a homogenous, plastic hotel chain - le Castel des Anges looked perfect. On arrival we were given a guided tour of the chateau and it was immediately apparent that the owners had had a clear vision of the atmosphere and luxurious surroundings they wished to create. Right down to the layout of the excellent breakfast table and what can only be described as a work of art in the presentation of the food. Extremely comfortable room, perfect nights' sleep and plenty to eat at breakfast. We stayed two nights but could have stayed longer - this gem of a hotel exceeded all expectations.